Well, I thought I'd give the ol' mini spreader bar a try and see how she rides. 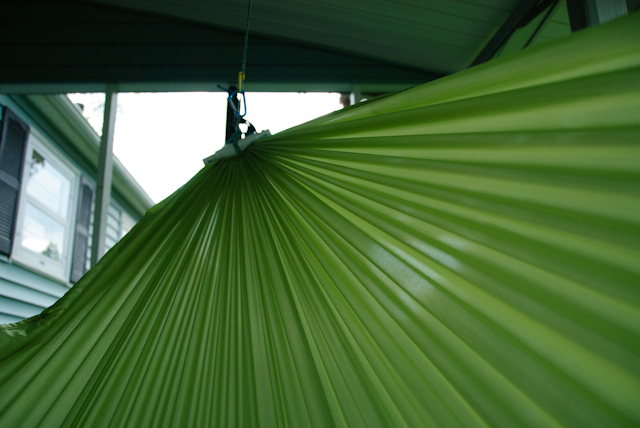 Its not elegant but it has significantly reduced the ridge down the middle of the hammock. Two nights ago this same hammock was a Knotty style gathered end, and it hung fine between trees but on my hammock stand it had a significant ridge down the middle. 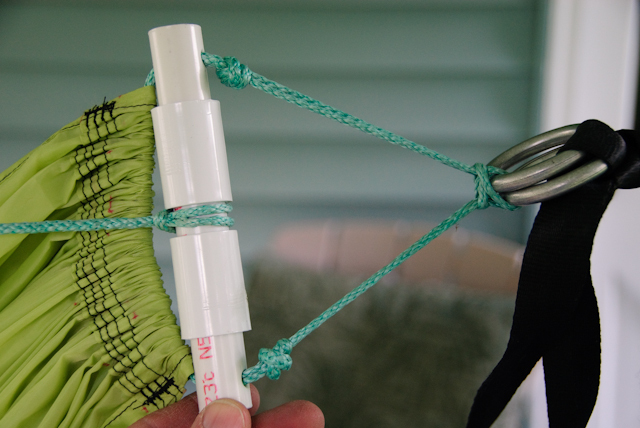 So today I modded it to an end channel hammock (if thats the right term) and put the little spreader in there, I also tried it sans spreader and there is a definite difference. Tried a few diff spreader configs before I got it to hold still, so there are clearly some forces at work up there. I tried it between a few different trees and it was quite nice, I just got back from trying it on my hammock stand and its 100% different from what it was two nights ago. I don't think its a perfect solution, but its a good start on the leg ridge thingy. As always I'm open to ideas on how to make this better. I actually thought of putting the PVC inside the end channel, but it wouldn't fit (should have thought of that before I sewed it. Last edited by Redoleary; 05-04-2012 at 10:15. Deep peace without end to you. Very ingenious way to solve the ridge issue. Nice sewing work as usual. "In my world everyone is a pony, and they all eat rainbows, and poop butterflies." Very nice. Gives me some ideas. Thank you. This forum is full of ingenuity. "No whining in the woods"
That looks really nice. Might have to try that on one of my hammocks. I would think it should help alleviate some of the shoulder squeeze issue I have. What set of materials did you use? Since you already have the apparatus set up, and the channel line looks very strong, I suggest the following experiments, varying the amount of line and sag between the spreader bar and the channel. Just carefully insert toggles, in the form of carabiners, midway through the cord on the suspension end at marked and varying lengths. You could use knots, and I'm not worried about strenghth, but the toggles will be easier to remove. 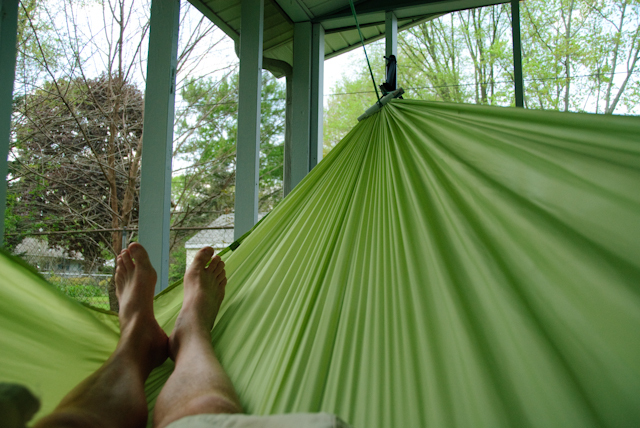 Your weight in the hammock will pull the line through and the carabiners against the spreader bar. That is some excellent and very interesting work, Red! I have always said that my non-bridge hammock with the least calf ridge problem is my huge Safari. But coming in very close to it ( and close enough really) are my 11 foot WL Light Owl and Claytor No Net. But the Claytor is only 10 ft long. I have oft wondered if the channel is a big factor it's comfort, although I have tried at least one other channel hammock that is not as good. But I have also wondered what it would be like if the channel did not bunch up so much once I was in it, if it would be even better. I have even tried once or twice connecting the foot end suspension to different trees, but I think it still bunched up. But that is a neat little spreader, and it is interesting to hear that it significantly increases comfort. Have you tried any different bar sizes? Last edited by BillyBob58; 05-03-2012 at 16:10. Thanks CW, I don't thinks its solved but we're moving in the right direction. Thanks, let us know what you come up with. I was thinking a little more on that while riding my bike. One could put a slight bend in the tube and that would further reduce the ridge, but I think you'd have to tack the ends of the fabric to the ends of the tube??? Its all just a theory at this point. It's 1/2" pvc with couplers in middle to keep the RL from sliding to the sides. Its a 24" continuous loop (when pulled tight its 24" long) of 7/64" amsteel and each end is larks headed onto some SMC rings. ThanX DstiX. I would think that the further away from the channel the bar got the more closely the fabric would gather? Yes? Thank you BillyBob .This hammock is only 10' long also. The first two bars I tried were only 5" long this last one is 6" and I think is better that the 5". I didn't want to put the knots in the line above the bar but I couldn't get it to stay still with out them. The whole thing is a bit clunky at the moment but pvc is just so easy to work with, its like legos for adults. 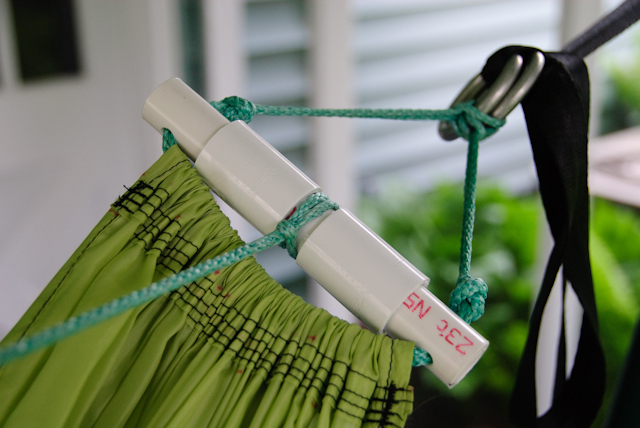 Instead of using knots could you use a Solomon Bar or whipping to hold the PVC in place? Just to make sure I'm understanding. The loop is larks headed to the rings, passes through the PVC, channel, PVC and is again larks headed to the rings? Also I haven't done much with PVC pipe. So, does it go pipe with hole, connector, short piece, connector and second piece with hole? I'm guessing they're not glued? End channel hammock into a whipped end?